Published Wednesday 3 April 2019 Local people are being welcomed to the brilliant new Acton Skatepark with a celebration of all things skateboarding at its official opening this month (13 April 2019). The event takes place in Acton Park, East Acton Lane, London W3 and is best accessed from the East Acton Lane or East Churchfield Road entrance. There will be a huge range of activities to enjoy, from free beginners skateboarding lessons, pro skater demos and competitions to music and DJs, t-shirt giveaways, food and drink, and even a classic car and hot rod display. Activities will start at 10:30am and run until 5:30pm, with the official ribbon cutting and speeches commencing from 1pm. 4 - 5.30pm: Skate competition with prizes on offer. The main construction work at Acton Skate Park is now complete and with the facility open, and is already receiving great feedback from skaters and park users. The council has worked closely with the Ealing Skate association, the Apple community facility and the local skating community to create a high quality, safe skatepark within the area for all to enjoy. It boasts open bowls perfect for skateboarding, alongside a plaza section suitable for all ages. 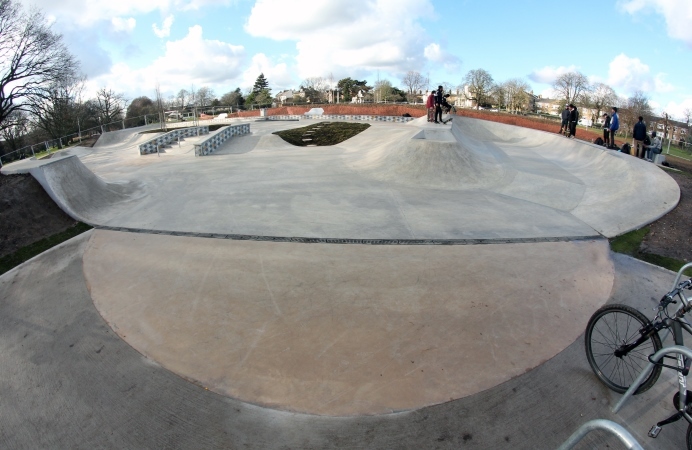 The facilities are free to use and have been designed to provide an ideal place for skateboarding and for those who enjoy watching the skills and dedication on display. The council’s existing skate park facility near Gurnell Leisure Centre in Perivale has proven to be a great place of interaction between people of all ages, older children helping and teaching younger ones and adults skating with their children. It is hoped that Acton Skatepark will have a similarly positive effect on the community. Cllr Bassam Mahfouz, cabinet member for finance and leisure said: “I’m delighted to see Acton Skatepark open for young people to enjoy and I encourage everyone to come along to the opening event to see what it is all about. “Despite the popularity of skateboarding and its recent adoption as an Olympic sport, there are very few dedicated skate parks in the west London area. This is now the second in Ealing - meaning young people have even better access to suitable facilities and do not have to travel so far to practice and enjoy skateboarding. I am confident that, like our existing Skatepark at the Gurnell Leisure Centre, Acton Skatepark will prove popular with residents, provide a safe environment to take part in sports and represent a real community asset for the local area. Another new feature in Acton Park is a brand-new water fountain that was been installed by the council in partnership with the Mayor of London’s Drinking Fountain Fund. It is the second fountain to spring up in the borough, following the one at North Acton Tube station, opened last year. By installing these two fountains in the borough, the council hopes to encourage people to refill rather than buy bottled water and cut plastic waste by reducing single-use bottles.